My grandmother's house in India had a wildly growing garden. Trees of all kinds grew around the age old garden, leaning over the solid brick parapet that surrounded the house. Guava trees with their albino limbs and pale green leaves, Jamun trees with marble sized juicy jamuns hidden in their leafy canopy, jackfruit trees where the jackfruits clung onto the tree like koala babies and loads and loads of flowering trees from shiuli to tagor. I don't know who planted the trees or who take care of them, for I never did see anyone take care of them regularly. Once in a while my grandmother would get hold of some poor guy walking the lane on a solitary afternoon in search of odd jobs and then she would entice him with prospect of food and easy money. That is how she got all her weeding done and kept the garden neat. But I never did see anyone spraying fungicide or pouring insecticide or do anything thing fancy in there. Most of the trees in that garden were old and big anyways and knew how to take care of themselves. In that garden there was this Ka(n)thal gaach -- a jackfruit tree, where jackfruits grew in abundance hanging around the tree like koala babies. Since no one at our home was fond of ripe jackfruit smell, the jackfruits were plucked when they were green and young and called "Enchor" in Bengali. "Enchore paaka" was also a term often used when any adolescent tried to act smart-alecy. Given that it was actually a much adored vegetable, it was hard to figure out, that the term was not actually a compliment! 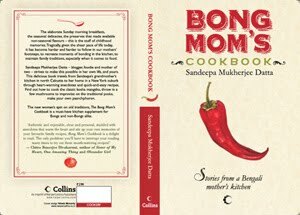 As a result of all this abundance of enchor, green jackfruit curry or enchor er dalna was quite a common dish at our home. Though honestly cutting green jackfruit, with all its thorns and spikes and sticky glue, was no mean feat and it would be an elaborate affair compassing couple of hours. As is the rule, I was not much fond of "enchor er dalna" as a child. The adults loved it. They called it "gaachh pantha", the vegetarian meat. Much later would I know that it tasted a lot like pulled pork. But at that point I didn't appreciate the soft fibrous texture of green jackfruit in a curry. My mother sometimes made koftas with the green jackfruit, like meatballs, the jackfruit boiled and mashed with potatoes and spices and then fashioned into spherical balls which were deep fried. They were soft and delicious, more after soaking in the spicy gravy. Now those I absolutely adored. After coming to the US, the canned green jackfruits took my fancy. They were easy to cook with no jhanjhat of cutting and had a more softer texture as they were canned in brine. I loved cooking all kinds of dishes with enchor. Enchor er dalna., Enchor er Kofta, Enchor er Chop -- I loved all. And then the other day I made a Enchor Chingri Malaikari where the enchor is cooked in creamy coconut milk along with shrimp. It has a perfect balance of sweet and spicy. Honestly there is nothing not to love in a combo like that. 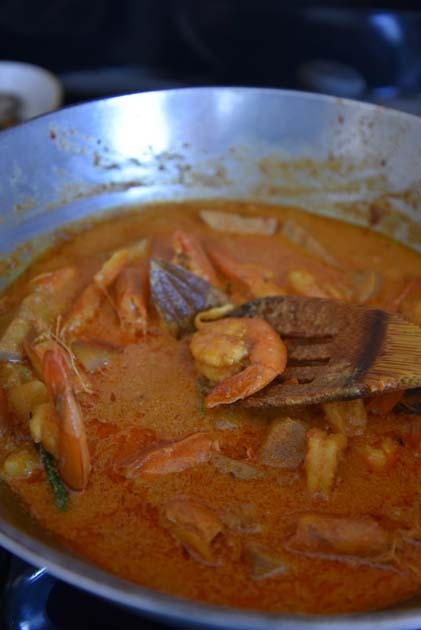 And if you want the dish to be vegetarian because it is Navratri, just skip the shrimp! 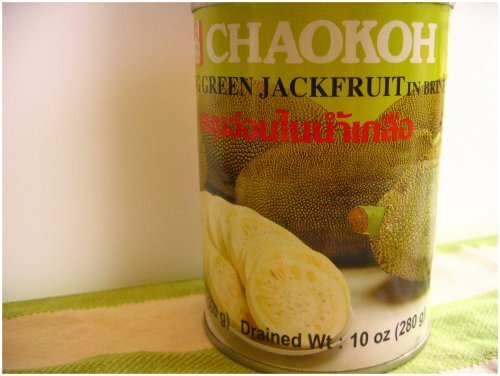 1 can of Chaokoh Green JackFruit ~ 1 can is about 570g. I got it from my Indian Grocery Store, you can try other Asian stores too. It is here on Amazon, but the price of the same can is 3 times as compared to my local store!!! If you get the fresh jackfruit, I suggest get help in cutting it up and then follow the recipe. 12-14 jumbo shrimp ~ if using frozen then thaw. If fresh then clean. Then toss them with little turmeric powder and salt. Chop the Jackfruit pieces in Cubes. Chop 1 small onion in large chunks --> fry till soft and brown on the edges --> cool and blend. Make a puree of canned or fresh tomatoes. About 1 fresh tomato or 1/2 of a can. Saute the shrimp until they lose their raw coloring. Remove and keep aside. Now we will saute the Jackfruit pieces. Lightly fry the jackfruit pieces in oil. Remove and keep aside. Similarly saute the potatoes. Remove and keep aside. Add a little sugar and fry them till they are light brown in color. Add the pureed tomato and the green chilies. Continue frying till the tomatoes are well blended, all mushed up. Add about 2 tsp of jeera Powder mixed in 1 tbsp of Yogurt to a paste and continue what we say in Bangla as “Kashano”. I don’t know how to explain this but this means cook, stir do the whole routine, till the masala looks and feels cooked. Note: Instead of only Cumin Powder, you can add 1 tsp of Bhaja Moshla + 1/2 tsp of Kashmiri Mirch. I normally lightly dry roast cumin & corriander and then make a large batch of such powder. 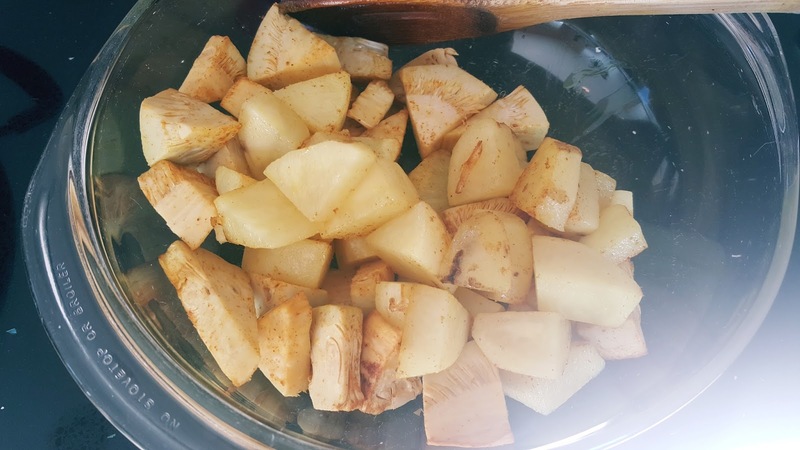 Add the sauteed potatoes and cubed green jackfruit and toss with the masala. Cook for some more time till the masala coats the jackfruit and the potatoes nicely. Mix 1 cup water + 1 Cup of thick Coconut Milk. Cook till Potatoes and Enchor or jackfruit is done. If you think the dish needs little more gravy, add 1/2 Cup of water + 1/2 Cup of coconut milk. Note: Finish off with a spoonful of ghee.